You put a lot of time into planning your event. For it to be as successful as possible, it can’t simply “run well”; everything about it has to look good, too! Before any plans are made, you need to establish the general style you want to project and then make decisions on the details that compliment that style. Do you want the feel to be sophisticated, contemporary, classic, fun, etc., or do you want a specific theme like Hollywood, circus, nautical, jungle, etc.? The sense of order that comes with the cohesive look of printed materials, stage and/or lobby décor, centerpieces, and attendee keepsakes given at an event reflects on the corporation or event organizers. Establish your style or theme with “Save the Date” postcards or magnets. Then, send out matching invitations. Create programs or menus which coordinate. 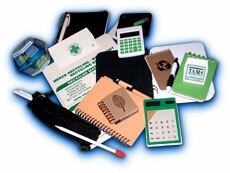 Imprint a keepsake with your company logo or event details to match your style. Wrap things up with thank you notes that carry-on your unique look. And All Things Eventful can work with you to provide it all! How many times have you heard “You never get a second chance to make a first impression”? This phrase carries as much truth with it for your event as it does for anything else. Don’t wait for the main event to “wow” your attendees – start at the entrance and draw them in with your theme. Then continue to hold their interest while once inside! All Things Eventful will use all of the tools we have – lights, sound, color, feel… Add drama with indirect lighting. Add dimension with plants. Soften acoustics with fabric panels or accent carpeting. Top it off with a wide selection of tablecloths, sheer table runners, colored napkins, and chair covers or sashes. We can work with your budget to help you pull together all of these elements for your event! Don't forget the centerpieces… Set your event apart from others with something that is customized and assembled specifically for your event. All Things Eventful offers both floral and non-floral options. Floral pieces can help set the mood with colors. Options include fresh-cut flowers or arrangements in either fresh, silk, or dried varieties. Non-floral pieces can help carry a highly-specific theme or add additional lighting elements, such as floating candles, votives, hurricane lamps, or battery-operated LED lights. 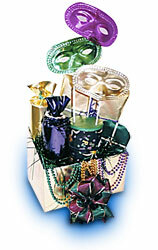 Besides take-home gifts for your attendees, All Things Eventful can design and provide other gift items for your event. Recognize your speakers by sending them theme-coordinated thank you gifts. Plaques or awards are a meaningful way to commemorate an event or celebrate and achievement. Show your appreciation by giving themed gifts to committee staff or event volunteers. Whatever the gift-giving need for your event, All Things Eventful is your source for the total package! You've shown your guests good taste in everything else you've done, so make sure the food – and presentation of the food, as well – meets the same high standard! The staff of All Things Eventful has worked with numerous area caterers in the east, west, and south sides of town. In our dozen years of experience, it's clear that not all food is created equally… We maintain a list of highly recommended providers for your catering needs, whether on-site or off-site – all of whom we've worked with. Save some room – beyond the main course, we also have ties with some fantastic bakeries and pastry chefs.